Your MINI Cooper is a unique sports car that’s expressive and distinctive. MINI Coopers are not only appointed with high-end materials, they are also extremely fun to drive and will help you get the best parking spaces in Chicago! To keep your MINI Cooper running its best, it’s important to bring it to an auto repair shop that specializes in MINI Cooper repair and maintenance services. That’s where the MINI repair specialists at Spotlight Automotive come in! You own a MINI Cooper because they are fun to drive, great fuel economy, affordable, great resale value, and in addition to all that, you don’t have to get regular maintenance as often as most cars. Actually, you can go two full years before needing any service after purchasing a new MINI. Still not every shop can perform MINI Cooper Repair and service to factory standards and specs. 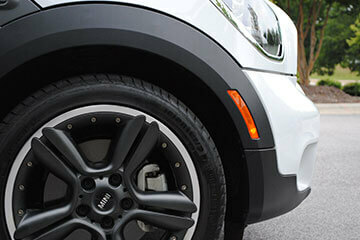 Let Spotlight Automotive in Chicago, IL take care of your MINI Cooper. We use nothing but OEM parts and factory approved equipment to perform repairs and maintenance services. Spotlight is Chicago’s dealership alternative to high prices and impersonal service. So if you want top notch customer service and factory spec repairs with OEM parts at a fair price then give us a call today or schedule your appointment online. Don’t get behind on your factory scheduled maintenance. While you may not need service the first two years of your car ownership; you will need a good MINI repair and service center to help stay ahead of costly repairs and possible breakdowns. Our technicians will create a personalized factory scheduled maintenance plan that fits your vehicle and driving habits. Let us help you stay ahead of costly repairs that are avoidable. Call today for your personalized plan. There are many reasons why you should choose Spotlight Automotive but I will only go over the main points here. We are family owned and operated. We hire nothing but the most personable and experienced mechanics in the area. Our Techs are all ASE certified and some have multiple Master Mechanic certifications for various manufacturers. We promise to provide dealership quality repairs and back all of our MINI cooper repairs with a 24 month guarantee and a lifetime guarantee on labor. We consistently beat dealership estimates by 40%. Our shop is equipped with all the latest tools, technology, and diagnostic equipment available. Every time we service your car, we will inspect your vehicle, make sure there are no immediate safety concerns, and make you aware of any thing you may need to keep an eye on. Our ultimate goal is to always keep our customers informed, answer any and all of their questions, and be their point of reference when it comes to car repair and maintenance. The next time you find yourself in need of MINI cooper repair or service think of Spotlight Automotive. Call (312) 967-0732 or schedule your appointment online today!